is anyone using Powershell to access Caché terminal in non-english systems? i wanna connect to a remote server through Terminal. Failed to establish security context. so do i miss some configuration? I am a newbie so excuse my basic questions. I have installed Caché on Mac Os High Sierra 10.13.6 and have started the ObjectScript tutorial but I cannot open Terminal in Caché. n order to begin practicing using ObjectScript, you need to start the Terminal. Click the Caché cube icon in the task bar and select Terminal from the menu. This brings up the terminal window, and you can see from the prompt that we are in the USER namespace. Namespaces are logical directories, containing routines (programs) and globals (data). What types of solutions are out there for terminal based applications to output reports to a PDF document? 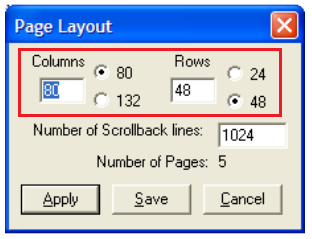 This is a roll-and-scroll application that has its own scripts for generating reports. In times past, terminal emulations have supported the concept of slave printing which seems like it should still be a viable solution. I know that in previous lives I have been able to do slave printing with software such as ProComm+ by Symantec (not available anymore). This terminal software worked very well with the VT emulation codes for enabling and disabling slave printing as well as worked very well with the Windows Print Manager as far as allowing the output to be redirected to any printer device (both physical and virtual). If ProComm were still available I'd just suggest installing a virtual PDF print driver and using slave printing. Curious what others are doing in the area of PDF printing? I know that I can write it all in 1 line, but I'd rather not do that. Is there a way to feed multiline statement into Cache? Also, how can I change terminal user's login password. But the command suddenly stopped opening the terminal in the correct namespace. It just opens it in the default namespace. I tried it with different namespaces or invalid namespaces, it always opens the terminal in the default namespace now. I cannot figure out what is causing this behaviour. Is there a better way to run these scripts? I have several variables defined in my bash script, what's the best approach to pass them into Caché? I am using terminal but I have some problem with it. I use $C(1) (ascii code 1) to separate data but I can't see it in the terminal and This is really hard to see in the table. how can I see it in the terminal ? I am writing routines in Studio & running them in the Cache terminal TRM:3672 (TRYCACHE). From a routine, how do I control print position within the terminal screen. I have tried using $X and $Y but this does not work and I cannot find what I need within the Cache terminal documentation. Hope this question is not too simplistic for Members. Can I get "Window Size" from terminal? By command line. I already tried to use 'do CURRENT^%IS', but without success. It does not return the change, for example, when the column is 132. Is there any routine or method for this? 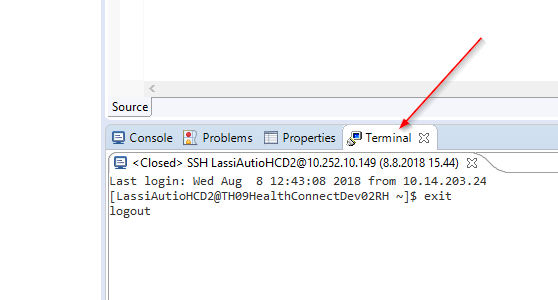 How can I connect using the Terminal to a remote server? I changed the server indication on the Healthshare icon on the Windows toolbar. The management portal works but not the Terminal. When I open the terminal it displays only some information about the server ("SSH-2.0-OpenSSH_7.2p2 Ubuntu-4ubuntu2.2"), but it doesn't give the possibility to log in. Do you have any suggestions how I could fix it? I am trying to run a command line code using $zf(-1) in cache terminal. it is returning access denied error. I have tried to run the code in cmd itself it is also throwing Access denied error. But if opened cmd as administrator and run the same code it is working perfectly. I am using windows system. Hence i need to know how can i run the cmd line code as administrator using our terminal or studio. Please help me out. I have a class. In class there is an index. This index is for quick search on name property. This class is mapped to some global ^GL(userId) = "Name*other data....****"
And there is also index global ^GLNameIndex(Name, userId) = ""
When I add new User entry through class, f. i. S user.Name = "Some name"
calling method %Save() adding new entry to index automatically. And this way index ^GLNameIndex is always actual. But in my program new user entry can be added without class interface, through terminal program. In terminal program new user entry is added by direct recording to global, f. i. S ^GL(userId) = "Name*other data." In this case, new user name is not adding to index global ^GLNameIndex and index is not actual.